On Monday 23 July, the London 2012 Olympic Torch Relay – presented by Coca-Cola, Lloyds TSB and Samsung – will travel 36.88 miles through the London Boroughs of Lewisham, Bromley, Croydon, Sutton, Merton and Wandsworth. 12.50pm – Battersea Dogs & Cats Home, Wandsworth: In recognition of our animal loving nation, former England footballer and supporter of the home’s work, Michael Owen, will carry the Flame on a special visit to the centre. Michael will help celebrate the dedication of the staff and volunteers who have rescued, reunited and rehomed over 3.1 million dogs and cats since the centre was established in 1860. Approximately 50 dogs currently in residence will form a special guard of honour for Michael, who himself is the owner of four rescued dogs. 9pm TX – Olympic Flame visit to Walford: EastEnder Billy Mitchell is to carry the Flame around Albert Square, with the last seven minutes of the programme to be transmitted live. 7.21am - Trinity Laban Conservatoire of Music and Dance: The first Torchbearer of the day Ceinwen Giles, 37, from Lewisham will carry the Flame outside the centre that is the UK’s only conservatoire of music and contemporary dance. Ceinwen was nominated through the LOCOG campaign for her bravery in fighting cancer which she was diagnosed with just four weeks after giving birth to her daughter. 7.46am - Stephen Lawrence Charitable Trust Centre: Doreen Lawrence, 59, from Catford will carry the Flame into the forecourt of the centre set up in memory of her son to offer a base for community learning and development. Doreen has been instrumental in changing part of the UK legal system as a result of the Stephen Lawrence Enquiry. In the aftermath to the inquiry, she continued to campaign for justice for her son and for others and in 2003 she was awarded an OBE for services to community relations. She is also the founder of the Stephen Lawrence Charitable Trust, a national education charity committed to providing opportunity and access to disadvantaged young people, fostering positive community relationships, and enabling people to realise their potential. Doreen will hand the Flame to Kieran Lang, 16, from Lewisham. Kieran was elected as the Young Mayor of Lewisham in October 2011. He represents the young people of borough in meetings with politicians, officers and partners to influence and make decisions about issues which are important to young people and the wider community. 10.46am - Crystal Palace Stadium: Marlon Devonish will carry the Flame for a lap of the world renowned athleticstrack. He competed as a member GB & NI Athletics Team for over 13 years, and 2011 saw Marlon compete in a record 8th World Championship. Marlon's honours include medals from European Junior Championships, European U23 Championships, Commonwealth Games, European and World Championships, and also the Olympic Games (Athens 2004 and Beijing 2008). 12.47pm - St. Andrew's School: Internationally acclaimed actor Sir Patrick Stewart, known for his Shakespearean stage work and leading roles in contemporary film and television is set to carry the Flame into the lunch stop. After the crew break, Twinelle Hopeson, 20, from Croydon who was selected through the Lloyds TSB campaign for winning double gold in the UK School Games, her commitment and dedication to her sport of Athletics and inspiring her peers through helping the Summer Trust Program in her community, will carry the Flame out of the lunchtime stop. 2.50pm – High Street: Stephen Ireland, 40, from Sutton will carry the Flame along the pedestrianised High Street. He was selected by Lloyds TSB for his fundraising for Marie Curie Cancer Care. 3.34pm – The Tooting & Mitcham Community Sports Club: TV presenter and former tennis professional, Sue Barker is set to carry the Olympic Flame into the Centre. Sue has been the BBC’s Athletics Presenter for the past four Olympic Games and is also a member of the BBC’s team to deliver coverage of the London 2012 Olympic Games. During her tennis career, she won the women's singles title at the French Open and reached a career-high singles ranking of World No. 3. 5.18pm - Wimbledon All England Lawn Tennis and Croquet Club: Tennis ace and British No.1 Andy Murray will carry the Flame through doors onto Centre Court for a special photo opportunity with the Young Games Maker volunteers from the local boroughs who are the Ball Boys and Girls for the London 2012 Olympic Tennis tournament. 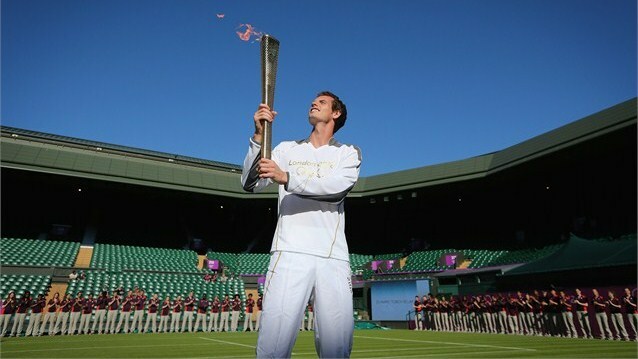 London 2012 will be Andy’s second Olympic Games and he is set to compete in both the Men’s Singles and Doubles competition that starts on 28 July 2012. Andy will then carry the Flame to Henman Hill where he will hand the Flame on to five times Wimbledon Ladies singles and five times Ladies Doubles champion Venus Williams for a second photo opportunity at the Olympic Tennis venue. Venus has won three Olympic gold medals to date and is set to compete in the London 2012 Olympic Tennis Women’s Double competition with sister Serena. 6.50pm – Tooting Bec Common: Final Torchbearer of the day Tim Henman will carry the Olympic Flame on to the stage to light the celebration cauldron. Tim is best known for his Wimbledon appearances, where he drew huge support from the British crowds and captured their hearts with his inspiring performances. He retired from tennis in 2007, after helping Great Britain to a Davis Cup victory over Croatia. Tim competed in the 1996 Atlanta Olympic Games, where together with partner Neil Broad they won a silver medal which remains Great Britain’s last Olympic tennis medal to date. The evening celebration will feature a variety of entertainment staged by LOCOG and the three Presenting Partners of the London 2012 Olympic Torch Relay - Coca-Cola, Lloyds TSB and Samsung - with support from the London Borough of Wandsworth. The evening celebration will take place in Tooting Bec Common in Wandsworth. The line-up includes music from the Rizzle Kicks, also a dance troupe who will provide a unique fusion of street performance, theatre and sport and dance act Twist and Pulse. There will also be local acts on stage Wanted Down Under - winners of the Wandsworth Young Performer competition 2011 and the Graveney School Choir. Towards the end of the two-hour show, the last Torchbearer of the day – Tim Henman - will light a celebration cauldron on stage at the event which will enable the Olympic Flame to be seen by the audience. Dave Berry and Lisa Snowdon will carry the Flame in Merton. The Capital FM breakfast presenters have been selected by Coca Cola. Lisa works with several charities in an ambassadorial role. She is an ambassador for Breast Cancer Care having lost a family member to the disease. Lisa attends events organised by the charity and has hosted their annual Pink Ball at the Grosvenor House Hotel, London. She is also an ambassador for Help A Capital Child and in 2009 completed a sponsored parachute jump for them raising almost Â£25,000. She has recently started working as ambassador for The Meningitis Trust and last year completed an abseil from the top of St Guys Hospital London in order to raise money and awareness for them. Dave works for a number of charities on a regular basis. Recently he has hosted events/shows for Unicef (Soccer Aid) and Comic Relief, and devotes a significant amount of time to Demelza House, a hospice for terminally-ill children. Alongside his personal commitments he also acts as an ambassador for Capital FM`s charity Help A Capital Child, spending time to visit projects that the charity funds, most recently a Teenage Cancer Trust unit at UCL Hospital, bringing a smile to the faces of the teenagers he met. Fred (Skip) Webb, 85, is set to carry the Flame in Croydon. Selected through the Samsung campaign for devoted his entire life to Scouting, first as a leader then a District Commissioner and now in his later years as a fellow of the boy scouts. This alone is amazing but added to this is his commitment to the local Scout Camp at Chalfont. Every weekend and often during the week Skip will be found out at large helping others. Jordan Dalrymple, 18, from Kennington will carry the Flame in Wandsworth. Jordan is a Volleyball player and Lloyds TSB Local Hero from Kennington. He was selected through the Lloyds TSB programme because of his commitment and dedication to his sport of Volleyball and inspiring his peers through coaching juniors within his school. Jordan has been England Cadet Squad Captain.